This tour offers the best way to discover the true essence of Norway with a spectacular tour of the Norwegian islands and fjords, through the tunnels and over the bridges of the famous Atlantic Road and a visit to Håholmen on board a Viking ship. A truly unforgettable excursion! 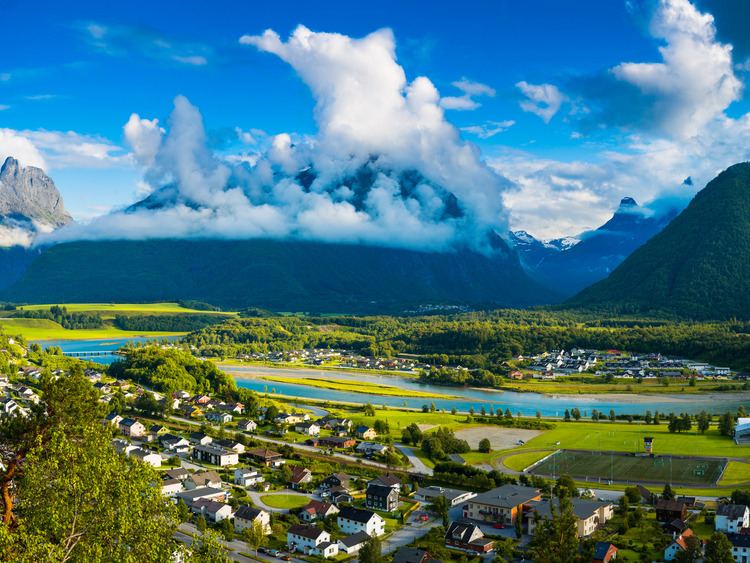 We depart from Åndalsnes, a wonderful village on the shores of the Romdalsfjord, surrounded by romantic mountain peaks, and the terminus of the Rauma railway line, and cross the Isfjord and the Rødvenfjord. We then head for Åfarnes, where we board the ferry to cross the Longfjord. We dock at Sølsnes and drive through the underwater tunnels and across the bridges of the Atlantic Road, an 8-km stretch between the Norwegian towns of Kristiansund and Molde, which connects various towns and small islands in between. As well as being selected as the "Norwegian construction of the century", this road was declared a "National Tourist Route" in 2005 thanks to its bridges and the spectacular coastline it crosses. It is considered one of the most dangerous roads in the world because, in adverse weather conditions, the strong wind and storms make driving extremely challenging. When we reach Geitøya, we embark a boat to return to Håholmen. Weather permitting, we will board a replica of a Viking ship, the Saga Siglar, on which adventurer and explorer Ragnar Thorseth travelled the world. In the event of inclement weather, we will use a modern ship as a means of transport. The Håholmen Archipelago is a collection of 20 small islands which was once used as a meeting point for fishermen, sailors and traders. Ragnar Thorseth inherited Håholmen from his grandfather who lived there until 1978. In the 17th century, Håholmen was a flourishing stock fishing village. Today, this 10-acre island directly overlooks the ocean and navigation channels. In Håholmen, we enjoy a fascinating film about Thorseth's travels aboard his three Viking ships and enjoy a typical lunch in a rustic restaurant. The tour continues from Håholmen along the Atlantic Road and passes through Husavik, famous for its dangerous underwater archipelago. We then return to the ship. The excursion includes a coach journey of approximately 4 hours in total.